« Did the pot just call the kettle black? 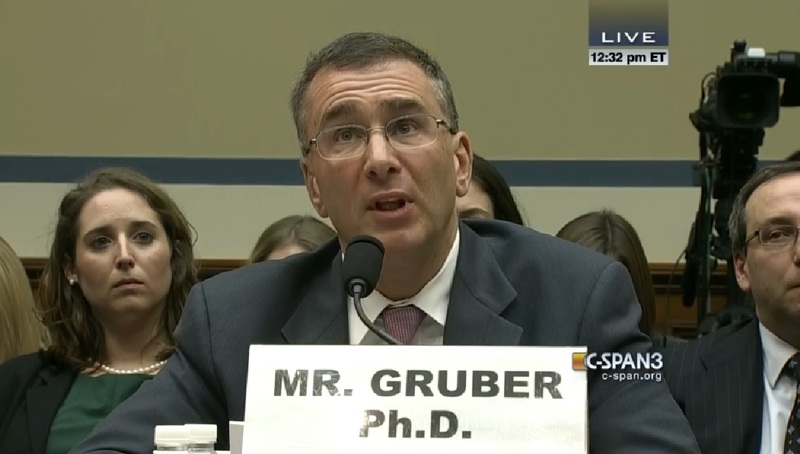 ObamaCare architect, Jonathan Gruber has been removed from the Massachusetts Health Connector Board after calling the American people stupid. The MIT economist professor was involved in the construction of ObamaCare visiting the White House on several occasions and has also made several controversial statements linking abortion to eugenics, the reduction of welfare, crime, and black births. 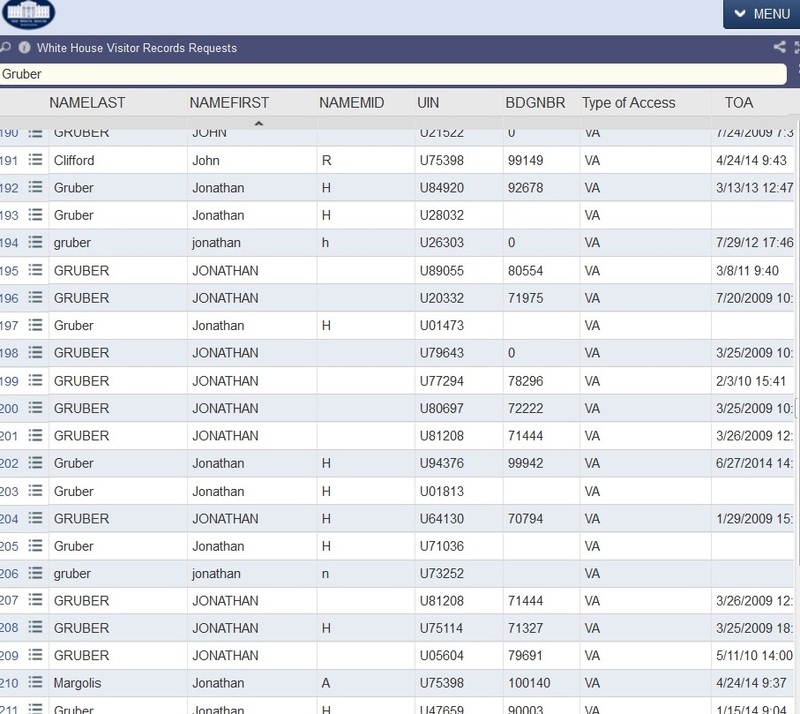 A look at the White House visitor logs reveals that Gruber was a regular at the Obama White House. 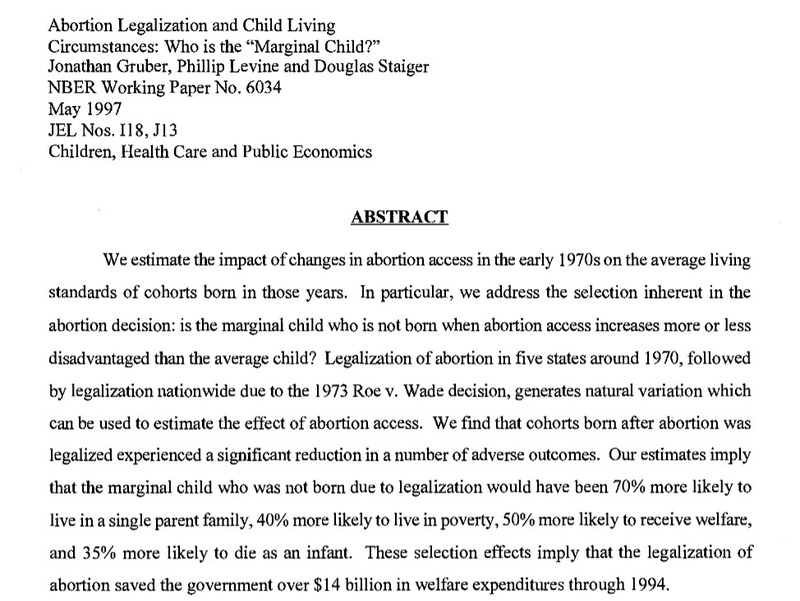 In Gruber’s 1998 paper, “Abortion legalization and child living circumstances who was the marginal child,” he concludes that the legalization of abortion saved the government fourteen billion dollars in welfare payments. “Two earlier papers investigated the implications of such positive selection through abortion for the quality of cohorts born after abortion legalization. Gruber, Levine and Staiger (GLS, 1999) found that the legalization of abortion led to significant improvements in the circumstances of children born into cohorts where abortion was legal. Such cohorts of children lived in households with lower rates of single motherhood, welfare receipt and poverty, and experienced lower infant mortality than nearby cohorts of children. Donohue and Levitt (DL, 2001) focused on a relevant outcome for children at older ages and young adults, crime.1 They found that increased use of abortion in the 1970s resulted in lower crime rates among the cohorts born in that era when those cohorts were in their late teens and early 20s,” the paper reads. In a 1999 paper published by the American Journal of Public Health Phillip B. Levine, Douglas Staigei; (both co-authors with Gruber on his paper) along with Thomas J. Kane and David J. Zimnmerman, entitled, Roe v Wade and American Fertility, the group points out that when abortions are made legal, fertility rates drop with a reduction in births of teens and non-White women to be the largest. “Estimates show that births to non-White women in repeal states (vs states with no law change) fell by 12% just following repeal, more than 3 times the effect on White women’s fertility,” that paper states. 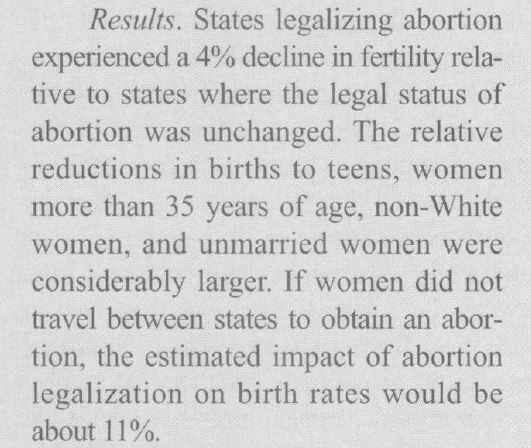 The group also concluded that there was an important connection between the fall of birth rates in states where abortion was accessible vs. states where it was not, “The results indicate that travel between states to obtain abortions was important. 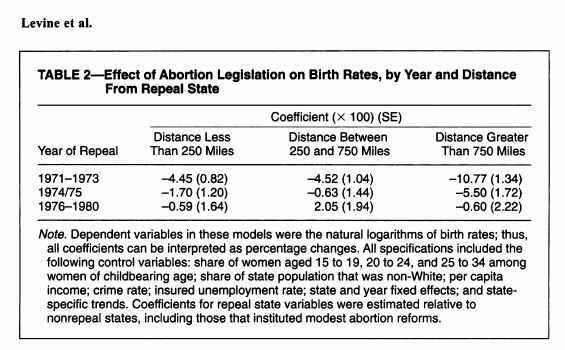 Births in repeal states fell by almost 11% relative to births in nonrepeal states more than 750 miles away but only by 4.5% relative to births in states less than 250 miles away and those in states between 250 and 750 miles away,” the authors write. 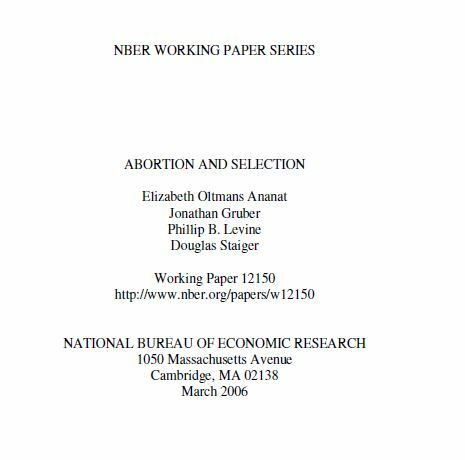 Back to his paper, Abortion and Selection, Gruber repeats the oft heard eugenics reason for abortion, that it reduces welfare. Gruber and the other authors also conclude among other things that the there is a link between increased abortion access and a reduction of crime. According to Life News, in Harvard University’s Quarterly Journal of Economics, Donahue and Levitt concluded that “Legalized abortion contributed significantly to recent crime reductions. … Legalized abortion appears to account for as much as 50 percent of the recent drop in crime.” The authors noted, “Crime began to fall roughly 18 years after abortion legalization,” and that the social benefit of this decrease in crime is about $30 billion annually. Donohue and Levitt wrote that, since 1991 ― 18 years after Roe v. Wade legalized abortion ― murder rates have fallen faster than at any time since the end of Prohibition in 1933. They added that the five states that legalized abortion earlier than 1973 [New York, California, Washington, Hawaii and Alaska] also experienced earlier declines in crime. Finally, they found that states with especially high abortion rates in the 1970s and 1980s had equally dramatic crime reductions in the 1990s, Life News reported. 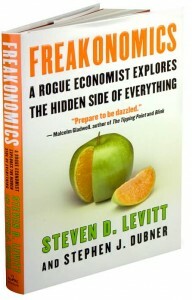 Levitt went on to co-author the 2005 bestseller Freakonomics, in which he reiterated his thesis that the legalization of abortion is responsible for half of the recent drop in violent crime. So, if Gruber and his friends can conclude that the fertility rates among “Non-White” women drop substantially when abortion is legal and then claim that a reduction in crime also follows legalized abortion- what subtle messages are they implying? Since it’s inception, we know that abortion has been a tool for the eugenics movement and we also know clearly – just who- that movement seeks to target. I may not be an MIT economist, but, I can do the math here – and so can you. This entry was posted on February 26, 2015 at 4:20 pm and is filed under Abortion and Crime, Black Birth Rates, Eugenics, Gruber with tags Abortion, Abortion and Selection, Black, Black fertility rates, Crime, David J. Zimnmerman, Douglas Staiger, Elizabeth Oltmans Ananat, Eugenics, fertility, Freakonomics, Jonathan Gruber, non-white, Phillip B. Levine, Population Control, pregnancy outcomes, Roe v Wade and American Fertility, Steven Levitt, Thomas J. Kane. You can follow any responses to this entry through the RSS 2.0 feed. You can leave a response, or trackback from your own site. Does it take criminals to fight crime? The truly ugly agenda of the founder of Planned Parenthood raises its racist, elitist head.